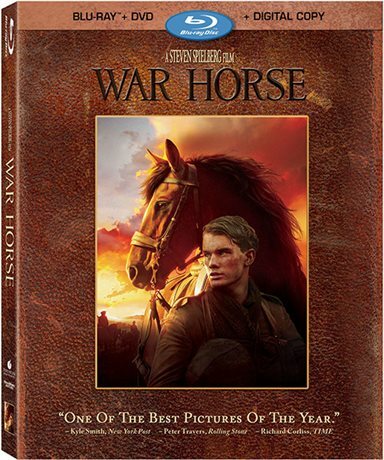 War Horse is a Blu-ray worth picking up! When the 2010 Academy Awards nominees were announced they seemed to justify the expansion of the Best Picture category to ten slots. But when the 2011 nominees came down, some began to wonder: is there really a benefit to nominating so many films? While The Artist, The Descendants, Hugo, Midnight in Paris, Moneyball and Tree of Life earned their places at the Best Picture table, Extremely Loud and Incredibly Close, The Help, and War Horse were polarizing, overly sentimental films nominated solely for their subject matter (September 11th), performances (Viola Davis and Octavia Spencer), or film makers (some dude named Steven Spielberg). Apparently there wasn't a tenth film worthy of filling out the list either. Certainly not Drive, Martha Marcy May Marlene, 50/50, We Need to Talk About Kevin or David Fincher's The Girl with the Dragon Tattoo. Or even The Adventures of Tintin, a superior Spielberg production in almost every way. Still, there's something to be said for War Horse; something that can't be said for Extremely Loud and The Help. Like Hugo and The Artist, Spielberg's adaptation of Michael Morpurgo's 1982 children's novel takes us back to the Golden Age of cinema, something often overlooked by many, an era of sweeping silver screen epics and magnificently shot, exquisite classics. And while its maudlin pace and unbridled histrionics will strike many as dated, Spielberg rarely pulls in the reins, allowing War Horse to run wild and free wherever its heart leads. War Horse quite literally tells the story of Joey, a loyal thoroughbred born in England, trained by a young man named Albert Narracott (Jeremy Irvine), and eventually purchased by a British cavalry officer (Tom Hiddleston) to serve in the first World War. But the field of battle is littered with machine guns and tanks, armaments that render the horse-led charges of yesteryear futile and obsolete. Horses and riders are mowed down by the thousands, as the British struggle to adapt to the new rules of warfare. Joey survives the worst of it, forging a special bond with a black horse called Topthorn and making his way across war torn Europe, where he's captured and put to work behind German lines pulling heavy artillery. Meanwhile, Albert is finally able to enlist in the army, where he encounters a new danger all his own: deadly mustard gas attacks. Against all odds, Joey and Albert overcome every obstacle placed in their paths; paths that inevitably cross when Joey, weary and scarred after years of front-line fighting, re-unites with his old friend and master. Spielberg goes to great lengths to cast the British and German soldiers in a reasonably sympathetic light, using Joey as a means to examine the very human commonality of the opposing forces. With little care for causes or politics, a horse is, in many ways, a perfect vehicle for crossing the lines in a World War I saga, and it's easy to see what attracted a director renowned for his uncompromising portrayals of WWII to the tale. Longtime Spielberg collaborator Janusz Kaminski captures it all with heart-aching beauty too, whether its sun-struck hillside of a farm in Devon, a dusk-veiled field strewn with fallen horses and soldiers, the mud-spattered trenches of no-man's land, or the debris-dusted cities and villages caught in the middle of WWI's titanic battles. The sights and sounds of Spielberg's war are more authentic than anything else, though, with performances ranging from distressing but weepy to effective but schmaltzy to moving but stagy. The horses are the more convincing actors, truth be told, even though Irvine, Hiddleston, Benedict Cumberbatch, David Thewlis, Emily Watson and their co-stars are pushed to embrace the theatrics they employ, rather than choosing to do so of their own volition. That said, the resulting tone is as gallant and nostalgic as it is detrimental to the film's war effort, and the tenor of the picture is at least consistent in its grand strokes, much as it will wear out its welcome with modern movie-goers. Sentimentality is a divisive beast, driving some to tears and others to scowls, and War Horse is a divisive melodrama through and through. The first World War provides a decadent spread of overtly saccharine sweets by which Spielberg indulges his cinematic appetites, and the power of the film suffers accordingly. For every haunting shot of a cavalry horse breaking through enemy lines without its rider, for every breathtaking scene in which Joey witnesses the horrors of the war, there's a teary eyed lament, an impassioned speech, or an act of anthropomorphic valor that seems at odds with the realities of the battlefield Spielberg strives to evoke. War Horse wears its heart on its sleeve without exception, and the connection between Joey and Albert goes beyond loyalty. Elements that resonate in the original children's novel simply don't have the same impact in a movie intended for adults. Given the cinematic powerhouse behind the production of the film, you can expect a super charged DVD and that is exactly what we have here. With 4 discs each packing their own punch, you would be foolish not to be impressed with the level of commitment here. War Horse: The Journey Home (Disc 1, HD, 20 minutes): Director Steven Spielberg hosts two round table discussions; one with the film's cast, the other with key members of the creative team and crew. Each half of the twenty-minute featurette has been edited and condensed into bite-sized chats but the carefully selected comments that remain offer welcome insight into the production, Spielberg's intentions, the characters and performances, the script and story, the horses and their training, the power of the film's themes, and more. An Extra's Point of View: Meet Martin D. Dew, extra extraordinare. He not only appears several times in the film, he worked almost every day of principal photography, filling the boots of British and German soldiers. A Film making Journey: While "The Journey Home" provides a relatively concise overview of the production, "A Film making Journey" takes its time, delving into the history behind the story, the development of the film, Richard Curtis and Lee Hall's adaptation, Spielberg's casting, and War Horse's shoot, locations, character arcs (human and equine), battles, production design, visual and practical effects and, really, any and every aspect of the film a fan might want to see explored. It's still not the three-hour monster documentary some Spielberg junkies will be hoping for, but it's quite good and well worth the time. Editing & Scoring: Editor Michael Kahn and composer John Williams discuss their personal attachment to the story, their work on the film, and their ongoing collaboration with Spielberg (who weighs in on their efforts as well). The Sounds of War Horse: Sound designer Gary Rydstrom hadn't worked with Spielberg in years, but soon found himself working to bring incredible authenticity to the film's sound design, the vocalization of the horses, the unique properties of the various locales, and the horse charges, field clashes, and trench warfare of the first World War. Through the Producer's Lens: Producer Kathleen Kennedy shares a beautiful collection of personal photographs taken on location. Clearly a lot of thought went into making these extras and that's really impressive no matter where you stand on the film itself. With all those extras plus a digital copy of the film for "on the go" movie watchers; War Horse is a Blu-ray worth picking up.